Funeral plans for former President George H.W. Bush have been released. He died Friday at his Texas home. He was 94. Tomorrow there will be a ceremony in Houston on Monday at 11:30 a.m. EST. Then his body will be flown to the D.C. area. He will lie in state in the rotunda of the United States Capitol from 7:30 p.m on Monday until 8:45 a.m. on Wednesday. Then President Bush’s coffin will depart for a ceremony at 1:15 p.m EST outside Houston. Around 5:30 p.m EST., his remains will be brought to St. Martin’s Episcopal Church where they will lie in repose. The funeral service will take place at 11:00 a.m on Thursday until 12:15 p.m EST. He will be transported by motorcade, then by funeral train car to College Station, Texas. 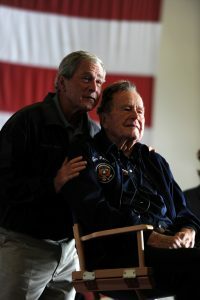 There he will be laid to rest with his wife Barbra and three-year-old daughter Robin at the grounds of his presidential library at Texas A&M University . This is the nation’s first Presidential funeral in 12 years.